On November 7th, 2006, a tornado struck Saroma, Hokkaido, taking 12 lives and injuring 23. This was big news broadcast all over the country by TV and radio. 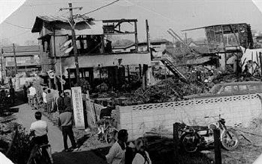 My house (located at the present Kodaira Dojo) was devastated by a twister in August of 1965. At that time, the Kodaira dojo was in an area that was nothing but fields all around. The Kodaira Station was truly a country station where you could get on and off the train without a ticket. In front of Hitotsubashi-gakuen station there was, for some reason, only a meat butcher shop, a pawn shop and a barber shop. I’m from downtown Tokyo and my wife is from Nikko in Tochigi Prefecture. She was ecstatic at first about the possibility of life in the big city but when she saw where we were going to live, she became depressed. She was already pregnant with Hiroaki when we got married. I wanted to be free to teach and practice Aikido however making a living teaching martial arts wasn’t a possibility in those days. “You have to support us! I’m not working!” she would insist whilst crying and crying, so I went to a company to work. Since I was being considered outside the usual job-hunting months which are May to July in ones senior year, I had to take a written test. I was not a newly grad, so that made me the only person who takes the exam that day. I found out that the proctor was a Meiji university graduate, just like me. I pleaded with him by saying “We’re alumni and I’m your senior! Give me the job!”, so I got the job. However, I had spent too many years teaching Aikido at my own pace, so working for a company didn’t suit me. I didn’t like working there at all, but I hung in there to make a living for my family. An act of God struck in August of that year. One afternoon I got a phone call from my wife that our house had been destroyed by a strong wind, and I should come home immediately. I couldn’t imagine what had happened, but my wife’s tone of voice was so urgent, so I went back home quickly. It took about 30 minutes to get home from the company. At Hitotsubashi-gakuen station nothing seemed to be changed, so I took my time walking home because I thought I’d been tricked. As I turned the corner towards home, I was shocked. There were tatami, furniture, and junk lying everywhere in the fields and on the road. I couldn’t believe my eyes as I picked my way through the mess. According to my wife, the sky had suddenly darkened, a strong gale blew off the roof and it hit the 3000 volt power line. That caused a fire to spread like a river from the sky (in those days the power line passed over the dojo parking lot). A bunch of tatamis stacked in the garden of the carpenter living next to my house went flying more than 50 meters, and rectangular lumbers flew breaking windows. I could hear the dog that was usually in the field, barking from atop a second storey roof. The damage extended over 100 meters in all directions but luckily no-one was injured. A week later when they had repaired 80% of the roof of my neighbor’s house, a typhoon hit and blew the roof off again. This time, the power line went down and burned the wall of my house. It was a big disaster. An old saying goes that “two events lead to a third.” 24 days after my son, Hiroaki, was born, a fire hit on my neighbor’s house. I never forget. It was November 27th. My wife was just out of hospital then. She found the fire first which eventually burned three neighbors’ houses. Although the walls and windows of our house got burned, the house itself was intact. Yet, inside of the house there was a lot of damage. My poor wife had to suffer three disasters during and after her pregnancy. It seemed that these events gave her tough time. Her younger sister was coming and going to help us out for months and it took about a year to get back to a normal life. I was troubled and wondered why all these disasters were happening to me. I concluded that all this had started to occur about the time I started doing that horrible company job. What I really wanted to do was Aikido, so from then on that was what I decided I’d do. After working for that aircraft company in Tachikawa for 8 months, I quit, and began teaching and practicing Aikido. I didn’t think much about making living for my family then. We were, somehow, able to continue living and made ends meet. If I hadn’t decided to quit the company job, there wouldn’t be “Aikido Kobayashi Dojo” and I wouldn’t be able to communicate with all these members and friends through Aikido. After awhile, my wife recovered her mental strength, and for that matter, even Ueshiba Kisshomaru doshu remarked that he was afraid of her. Without her support, I wouldn’t be able to continue my way of life as an aikido instructor. People at Aikido Kobayashi Dojo say that my 8th dan in aikido consists of 5 dans by my wife and 3 dans by myself. So together we’re 8th dan. She truly is the Goddess of Aikido Kobayashi Dojo.